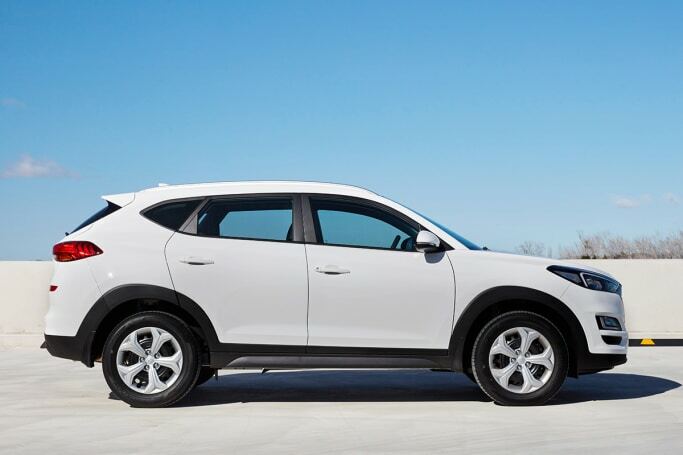 The Hyundai Tucson was never going to be left looking out of place amidst the Korean company’s more aggressively-styled SUV line-up – and so what you see here is the mid-life update of the popular mid-size SUV. Admittedly, the Hyundai Tucson 2019 model doesn’t look exactly like the smaller Kona or larger seven-seat Santa Fe. But there are some minor cosmetic changes for this updated Tucson model – and the underlying story here is that the amendments go beyond the metal. The Tucson’s tech has been upgraded, and so have the drivetrains – plus the model range has been tweaked. How does it all stack up? Let’s get down to the nitty gritty. The exterior design of the updated Tucson is largely unchanged – the metalwork hasn’t been altered, but there are new graphic differentiators if you take a look at the lights at either end of the SUV. Hyundai’s new cascading grille design dominates the front end, and while the shape of the headlights hasn’t changed, the inlays have, and along with the new bumper there are more angular LED daytime running lights. You can tell the higher-grade versions by the horizontal slatted chrome grille, while entry models have a black honeycomb look with a silver frame. The exterior design of the updated Tucson is largely unchanged. Sadly, you can only get LED headlights on the top spec, but the appearance on lower grade models which run halogen projector lamps is really dumbed down by the mix of crisp white angular lights and a round, yellowy bulb in the middle. The tail-lights are slightly different looking – again, with a different inlay, and again with LED only fitted to the top spec. The reflectors have moved up a bit, mirroring the i30’s Euro-look back end. Size from nose to tail comes in at 4480mm long, 1850mm wide and up to 1660mm tall (with roof rails). No matter which model you get, there’s not a sporty edge to the Tucson – you can forget about a body kit or rear diffuser, but there is a tailgate spoiler. 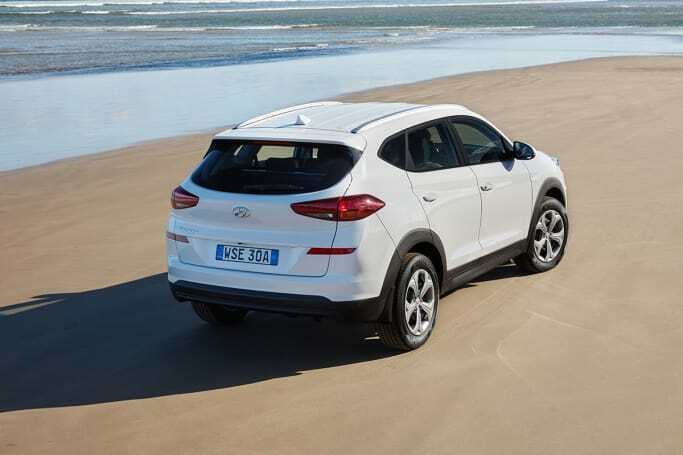 A set of side steps could be fitted, but may be unnecessary, because the Tucson doesn’t sit up that high. You guessed it, the interior dimensions are unchanged, too. But as the interior images show, there are now different options when it comes to the colour of the leather you can get. You can choose the lighter leather as part of a ‘Luxury Pack’. The changes inside include a dashboard layout that mirrors the Santa Fe and Kona, and looks a damn sight more modern than the existing set-up. It comprises a new tablet-style media screen, which is a 7.0-inch unit in the base model and this 8.0-inch screen in the rest of the range. The bigger screen adds digital radio and sat nav, but all models come with Apple CarPlay and Android Auto. Some people might like the screen being up on top of the dash, so it’s in your line of sight and easier to touch-control when you’re driving. Others will prefer where it used to be, down where the air-vents are now. The controls are all well placed, the seats are comfortable and offer good adjustment, and the storage is well sorted, too – there are cupholders between the front and rear seats, bottle holders in all four doors, and loose item cubbies here and there, too, plus a wireless phone charger in the high-spec model. There are two interior colour options on the Active X, Elite and Highlander leather-clad models, and it’s tidy. The back seat is very roomy, considering the external dimensions of the Tucson aren’t as big as many of its competitors. With the driver’s seat set in my position (I’m 182cm tall) and myself positioned behind it, I easily have enough rear legroom to be comfortable, enough toe room to stop them from going numb, and a lot of headroom, too – even in the high-spec Highlander with the lovely panoramic glass roof. You should be able to fit three across the back without too much hassle, and there are dual ISOFIX positions and three top-tether points. Rear air-vents are only fitted to the top two specs, which is annoying, and the top three models get a rear USB charger, but the base model misses out. 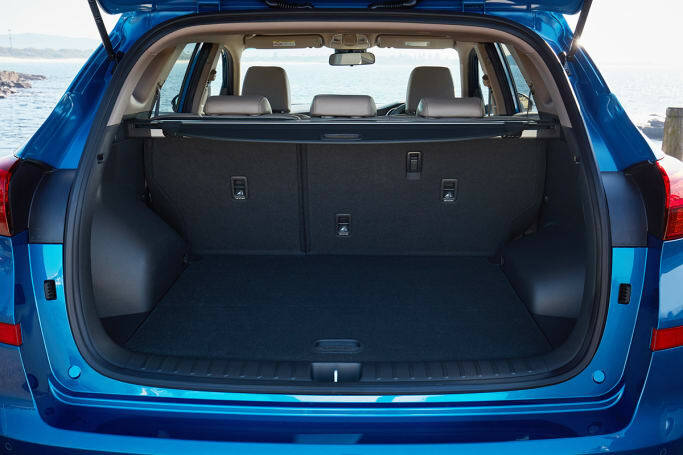 The boot space dimensions on offer in the Tucson are good – bigger than a Nissan Qashqai and Mazda CX-5. The luggage capacity is 488 litres with the seats up, and the storage space expands to 1478L with them folded down flat. Every model has a full-size matching spare wheel under the boot floor and cargo liner (and you get a retractable cover to keep prying eyes away from your boot cargo), and the top-spec gets an electric boot lid. If you’re a sales rep or have dogs, you might want to consider a barrier, which you can fit behind the rear seat. If that’s not enough size, every model comes with roof rails, so fitting a roof rack system won’t be too much of a problem. See the original post here..